mainland Europe, such as the pecking bird and the figures of the apostles. Fragment of the cross-head of the Easby cross, sandstone. The front face is carved with a bust of Christ, his right hand is raised in a latin blessing, his left holds a book.The figures right shoulder retains ribbed drappery in almost vertical folds. The back face is carved with a representation of Christ in Majesty, holding a book. The fragment is very worn and the cross arms are missing. The curvature of the fragment reveals wide arches from the top of the shaft to the start of the arms of the cross. Beaded edge moulding is continued from the shaft. Unusually for a monument of its size, the stone from which the fragment is carved, is not local to Easby. The medium-grained deltaic sandstone matches stone traditionally produced in the Aislaby quarries of Eskdale near Whitby. This fragment of the cross was formerly bult in to the fabric of Easby church. It was located in the exterior south wall of the chancel, close to the priest's door, with one face exposed. The cross from which this fragment comes was broken and mended at some time between its creation in about 800 and the use of at least three of the fragments as building blocks for Easby church, in the late twelfth century. Molten lead was used to mend the cross, a process recorded by Symmeon of Durham in a similar operation on a cross from Lindisfarne. The cross arms have been lost, however it has been suggested, based on similarities in scale, that the arms of the Easby cross would have originally been approximately 90 cm in width, the width of the cross arms of the cross found at Hoddam in Dumfriesshire. Historical significance: The tradition of monumental crosses in the north in this period reflects the early political superiority of the Northern kingdom during the Anglo-Saxon Heptarchy; the universal abundance of stone and the flourishing Christianity of the kingdom. During the period to which the cross has been dated, Easby was in the southern part of the kingdom of Northumbria known as Deira. While the kingdom experienced political turmoil with squabbles over kingship, the church conversely flourished and experienced a single-minded development. The location of Easby close to York, may reflect a link to the city and the thriving church there. This would certainly explain the Carolingian connection to which the decoration attests. The European connection to the area was two fold. Alcuin joined the court of Charlemagne in 782 and he was in constant contact withYork. His respect for the York library and scholars propagated an infusion of Northumbrian culture into the Carolingian court. A two-way traffic of materials and ideas was established with the Carolingian court. The other European connection was between York and Rome itself. The classicism of late antique and early ninth-century Rome informed the region's major monuments in motif and technique. Metropolitan status required frequent visits to Rome for the conferral of the pallium (A woollen vestment conferred by the Pope on archbishops in the Latin Church, who are required to request it as a symbol of their participation in the authority of the Pope and of their right to exercise the power of a metropolitan), this may explain the taste for portraiture of the apostles which became apparent in the region. 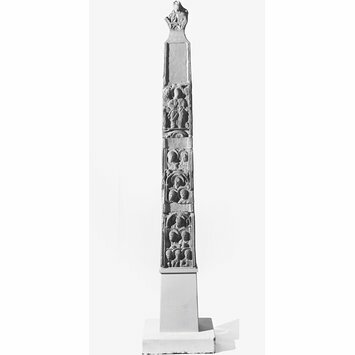 Vine-scroll with or without animal inhabitants is one of the most common motifs to be found on monumental crosses. In association with the cross and images of the apostles, vine ornament provides a visual reference to John 15:1-11 in which Christ declares "I am the true vine" and through a vine analogy, establishes what he requires of a disciple. The nature of the Easby vine-scroll is exceptional amongst the preponderance of monumental stone sculpture available. In seeking to record a sequential development in Anglo-Saxon sculpture using vine-scroll ornament, Professor J. Brönsted picked out the Easby cross as one of the earliest crosses. His assessment was based on a supposition that the ornament originated with foreign artists from the east, who had first-hand knowledge of the vine which gradually degenerated with subsequent generations of artists. Though Brönsted's analysis of vine-scroll development is no longer widely accepted, the eastern origin of the ornament is most probable, with examples to be found in the Dome of the Rock. There is evidence to suggest that the scroll was transmitted indirectly from this eastern source to Yorkshire. Ernst Kitzinger suggested that the cross represents an important stylistic stage-post in the iconographic chronology of Anglo-saxon sculpture. Citing oriental origins for the vine-scroll of many Northern crosses, he distinguishes Easby as having a "peculiar, thin and elaborate style" and convincingly concludes that the cross has a definite place in Carolingian art. He identifies a Carolingian ivory held in the Vatican to which the pecking bird on fragment A.9-1931 appears to be closely related and though it is no slavish copy, this close continental parallel has played a key role in dating the cross to the early ninth century. Professor Lang in his recent Corpus of Anglo-Saxon Sculpture states that "For such a work to appear in Yorkshire in the age of Alcuin is no surprise". The sides of the shaft stones bear the remains of alternating plant-scroll and interlace panels. The alternation of patterns, shows a continuity in layout and repertoire from early eighth-century monuments such as the Bewcastle and Ruthwell crosses . The strands of interlace are crisp and vertically incised and although they are unique in sculpture, some of the patterns appear on pages of the Lindisfarne Gospels. While different areas of decoration received different levels of treatment on other crosses, the control and elegance of the carving and the experimental variety of the interlace of the Easby cross are of a piece with the whole design of the cross. Williamson, Paul, The NACF and the National Collection of Sculpture. In National Art-Collections Fund Review,1986, p. 79.